In all my years as a Cape Cod Wedding Photographer I have never once wanted to leave this beautiful place. The number of options a photographer has here are legion. The views out over the Atlantic Ocean are unrivaled, as far as I’m concerned, and going further inland only opens up even more beauty for those looking for it. For a photographer, there is a lot more that goes into a photograph than just the subject. This is particularly true for a wedding photographer. If you ask most people, they will simply tell you that a wedding photographer takes pictures of people at weddings. This is partly true. However, anyone can take pictures of people at a wedding. A photographer is a storyteller. What they do is tell stories using pictures as a medium. Now, you’ve probably read a lot of stories that you thought were great. The characters were well developed, the plot was well woven, and the story built to the climax with a great pace. But did you notice the background? Did you see the mountains and the valleys? Did you notice the rivers, the sky, and the economic and political backdrop against which everything was set? These elements, while seemingly working behind the scenes, are a crucial part of the ‘flavor’ of the story. In a similar way, a photographer’s pictures need a good background to tell their story effectively. They will certainly give the pictures some ‘flavor’ and, depending on what kind of flavor the photographer is looking for, some flavors will do better than others. There are plenty of great wedding venues in Cape Cod, each giving its own flavor to the wedding and providing a different kind of magic for the photographers. I have a few favorites, which I’m going to list below. It really doesn’t matter whether you’re thinking of holding something small and intimate or you want to splash on a grand wedding affair, Sage Inn and Lounge can take anything. This beautiful wedding venue has the versatility you need to create a wedding after your preferences while still offering some of its unique magic to the mix. Located in Provincetown, Ma, this great wedding venue has 19 guestrooms that can be blocked or opened according to your wished and offers plenty of space for whatever wedding related even you’re looking to have. The second floor is well suited for cocktails and smaller dinners for fewer guests. The design is very sophisticated and offers a laid back ambiance through the use of muted colors and beautiful interior design. You can take pictures on the inside to allow some of this sophisticated air to rub off of them or you can go out into the garden and have a more playful and open wedding shoot. Whatever kind of wedding you’re looking to have, Sage Inn and Lounge is fully capable of making it a reality. Cape Cod is known to say classical Americana all over. Wychmere takes this vibe and combines it with the hidden glamor of its Longwood location to give a blend that simply cannot be outdone. It’s no wonder this venue is the gem of the Longwood beach. This little gem sits smugly on 20 acres of land, hugging the Nantucket Sound and harboring nothing but beautiful spaces within it. These include spacious indoor venues, a dock for boats, an ample amount of swimming pools, and a private beach. The sun, the water, and the sand meet for an intimate embrace in this venue, with lots of space for your guests (500 guest capacity). The secluded beach offers you a great opportunity to hold the beach wedding of your dreams while also taking some beautiful pictures as part of the bargain. There are great log fires for evening events and tents are available if you would like to shelter your guests from the elements. Sitting on the Falmouth Harbor is a wedding venue that is just as beautiful as the harbor: The Flying Bridge Restaurant. This beautiful restaurant is about as great as it gets as far as your wedding reception is concerned. But it doesn’t end there; you can have your engagement party here as well, your rehearsal dinner, and even your actual wedding service. You will love the decks around the restaurant and the views they provide. You can see beautiful panoramas of the entire harbor and in the distance you will catch a glimpse of Martha’s Vineyard. The staff at the venue are some of the friendliest and will hold your hand throughout the process, making sure your wedding is a roaring success. What might delight you most of all, though, are the pictures you’ll be able to take at this venue with the harbor and the sea beyond as your background. Cape Cod is a popular summertime destination for travelers near and far. At a ceremony and reception at this location, a Cape Cod Wedding Photographer is guaranteed to capture the beauty of rocky cliffs, stunning waterfronts and, most importantly, each beautiful, heartfelt moment. This Cape Cod wedding photo displays one of the smaller aspects of a reception, but it is no less significant in creating a day that is truly unique for the bride and groom. The image shows the pristine image of the table setting before the guests arrive at the reception. It is the calm before the whirlwind of excitement and joy that will soon take over the room. The photograph is clear and bright, with natural light flowing through the windows and illuminating the tables within the venue. Each piece of silverware is carefully placed, waiting for the guests to arrive and begin the celebration. 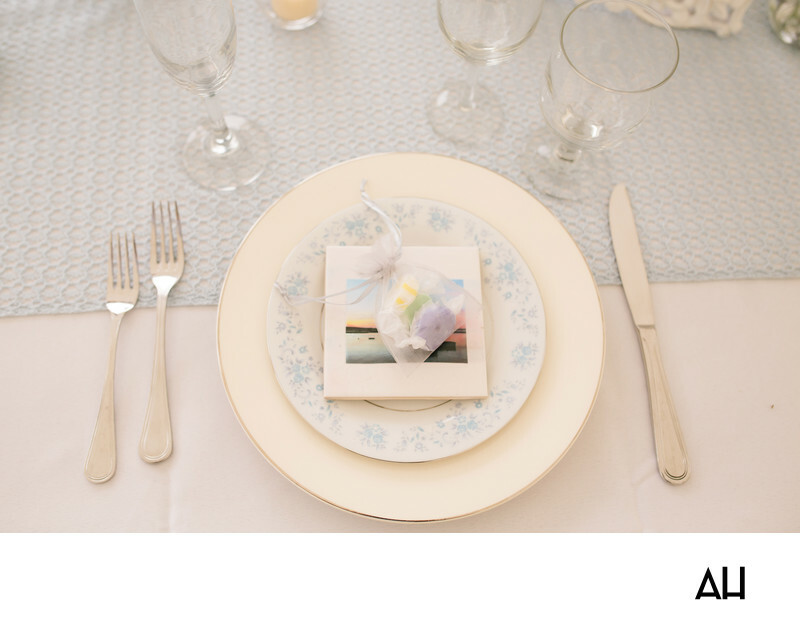 On each plate sit small candies in pastel colors, held within delicate sheer gift bags. The candies are placed on top of cards that show off a classic Cape Cod sunset. That sunset has special meaning for the couple, who have spent many a summer day on the shores of the Cape, just as they will spend this magical day.